People from Viet Nam and people from Japan have worked together to produce a film. The story told in the film comes from a book written by a Japanese woman who came to visit her daughter who was working in Viet Nam. The daughter thought she would stay with her for a year. However, she stayed for ten years where she had a happy life. HA NOI (VNS) — The first film produced by Viet Nam and Japan will be launched nationwide in October. 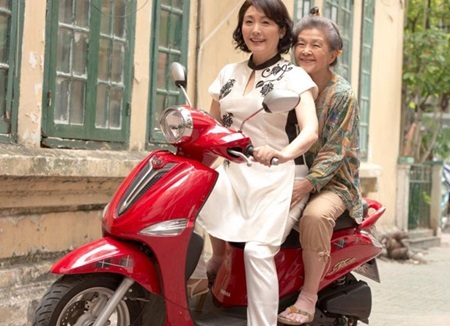 The film entitled Hoa Cung Lan Gio Viet (Blowing in the Winds of Viet Nam) is based on a non-fiction book, A Granny from Echigo, Japan Comes to Live in Viet Nam by Miyuki Komatsu, who currently lives and teaches Japanese in Ha Noi. Komatsu came to Viet Nam when she was 40 years old. During her 20 years living and working in the city she often thought of her mother living alone in Japan. After her mother visited Ha Noi, she decided to live in the city with her daughter. "I expected my mother to stay in Ha Noi for a year. However, we lived together here for about ten years," said Komatsu. Her mother passed away about one year ago in the city. The protagonist, Misao lives in Viet Nam teaching Japanese and working at the Voice of Viet Nam Radio. Her mother, Shizue, was born in Niigata Prefecture, Japan, and had lived a very tough life. Misao receives a phone call from Japan informing her of her father's passing. She returns to Japan for the funeral and sees her mother for the first time in years. She finds her mother struggling to cope and not comprehending her husband's death. Misao decides to bring her mother to Viet Nam to spend her remaining days. For Misao, Viet Nam is a special country as she was heavily involved in the anti-war movement during her college days in Japan. Misao was played by Japanese actress Matsuzaka Keiko, one of the leading actors in the Japanese film industry. She visited Viet Nam three times before the film was shot. "Speaking Vietnamese was the most challenging thing about the film," said the actress at the launch recently at Ha Noi's National Film Centre. In the film, she pronounces Vietnamese fluently and rides motorcycles well as if she was born in Viet Nam. On arriving in Ha Noi, the actress was stunned by the traffic and how people rode motorcycles in crowded streets. "The producers and director told me that I should enjoy life in Viet Nam. I want to thank the Vietnamese film crew who really helped me during shooting," she said. "This is the first time I've seen film and I see that Vietnamese people care about each other a lot. I could tell the audiences enjoyed the film at the launch". The film is directed by Ohmori Kazuki who has about 30 years experience in the Japanese film industry. "It's tough to portray accurately the realities of caring for an elder on film," the director said. "I was worried about film making technology in Viet Nam before I came here. But it was fine," he said. "I can't believe the film was made in just a year. We finished earlier than expected, which shows the benefits of co-operation between Viet Nam and Japan". The film score is a highlight featuring Japanese music from the Meiji dynasty in the 19th century to contemporary music. The film was produced by Japanese Ueda Yoshiaki, Okada Yutaka and Vietnamese Nguyen Hoai Oanh and Dang Tat Binh. It features Japanese Kuramura Reiko, Eiji Okuda and Vietnamese Tran Nhuong, Lan Huong and Diem Loc. A non-fiction book is one that is about a true story.
" Her mother passed away about one year ago in the city." "Passed away" is a gentle way of saying that somebody has died. The protagonist, Misao lives in Viet Nam teaching Japanese and working at the Voice of Viet Nam Radio. A protagonist is the leading character in a play, a book or a movie. Her mother, Shizue, was born in Niigata Prefecture, Japan, and had lived a very tough life. Some countries are divided into provinces, others are divided into states. Japan is divided into prefectures. The anti-war movement, in this case refers to the movement that was against the war in which the United States fought in Viet Nam. Something that is challenging is difficult and may need hard work to sort out. To pronounce Vietnamese fluently means to say words in Vietnamese so well that it sounds as if a Vietnamese person is saying them. Audiences are made up of people who watch performances such as films, plays and sports events. "It's tough to portray accurately the realities of caring for an elder on film," the director said. To portray means to show. "We finished earlier than expected, which shows the benefits of co-operation between Viet Nam and Japan". The benefits of co-operation between Viet Nam and Japan are the good things that happen for these two countries when they work together. A film score is a piece of music written especially for a film. The Meiji dynasty was a period of Japanese history. Contemporary music is music that people listen in today's times. 1. A dynasty that ruled in Japan two centuries ago. 2. The type of institution the film character, Misao, attended when she was part of the anti-war movement. 4. The month during which the film will be screened in the homeland of Miyuki Komatsu in Niigata Prefecture. 5. The language the film character, Misao, taught while living in Viet Nam. 1. Meiji; 2. College; 3. Actress; 4.September; 5. Japanese.